Have your teeth fallen victim to unsightly stains? Stains caused by tobacco, coffee, cigarettes, or soda can leave your smile not looking its best. Laser teeth whitening procedures have been used on celebrities for decades. Now, what the elites have been using to roll back the clock on their smiles is now available to the rest of us. Whiter teeth can give you an important confidence boost. After all, your smile is one of the first things people see and can leave a lasting impression. If you're interested in learning more about laser whitening techniques, read on. We'll share our top 5 reasons to consider laser tooth whitening and how you can put your best smile forward. Laser tooth whitening is a cost-effective, painless, and affordable procedure. Unlike many other cosmetic procedures, you won't need to save your pennies for years. Laser teeth whitening is a great way to upgrade your cosmetic appearance. You can reverse the visible signs of aging associated with yellowed teeth. The laser whitening process is extremely quick and typically takes about an hour. Think about all the time you spend completing remedial errands, waiting in lines, or catching up on television or social media. You can make a lasting aesthetic change in the time it takes to grocery shop. What else can promise results in the time it takes to watch an episode of your favorite binge-worthy television show? Anesthesia is not typically required, however, if you have strong anxiety or an overactive gag reflex, anesthesia can be administered if needed and laser teeth whitening has little to no risk for side effects. So how does laser teeth whitening work exactly? The difference begins with experience. Dallas Laser Dentistry employs some of the most diligent and skilled laser dentistry experts, so you can rest assured knowing that their years of experience will give you the optimal results you're looking for. The process begins with a protective covering for your gums. Then a high-end whitening gel is applied to the surface of your teeth. Dallas Laser Dentistry then uses a powerful diode laser that can reverse even some of the most stubborn enamel stains. There's a low risk for sensitivity and little maintenance required after your procedure. Many of our patients express that they regret having waited as long as they had before deciding to make an appointment for laser whitening. How long do laser whitening results last? That depends largely on the quality of the laser treatment you receive and your own aftercare efforts. Whitening treatments that use a laser such as Dallas Laser Dentistry's can give you lasting results. Results can last longer with regular teeth cleaning and use of a take-home touch-up kit after each cleaning. While making an effort to avoid beverages like coffee, soda, and red wine can also help keep your newly whitened smile from dulling over time, as long as you have regular professional cleanings you can still enjoy your drinks!. Making time for yourself can be harder than ever in today's day and age. Often, it isn't until office hours end that we begin to think about all the things we'd wished we'd done for ourselves during the day. Because a recent teeth cleaning is recommended before undergoing your laser whitening procedure, our office is happy to offer back to back cleaning and whitening treatments. This is also perfect for our clients who may not feel comfortable telling their friends about their cosmetic dentistry procedure. Plus, we’re open during lunch! Your cosmetic dental procedure is something personal and it's up to you whether or not you'd like to keep your cosmetic improvement discreet. For those who would rather keep their decision to undergo laser teeth whitening to themselves, a back to back dental cleaning and cosmetic whitening appointment can provide the perfect explanation for just why your smile has such a sparkling appearance. If you're ready to make an appointment and get your best smile ever, our staff of laser dentistry professionals are ready to answer any questions you may have. If you're thinking, this all sounds great but are unsure of whether or not you can afford laser teeth whitening, you're in luck. This cosmetic dentistry procedure is the least expensive way to dramatically improve your smile. 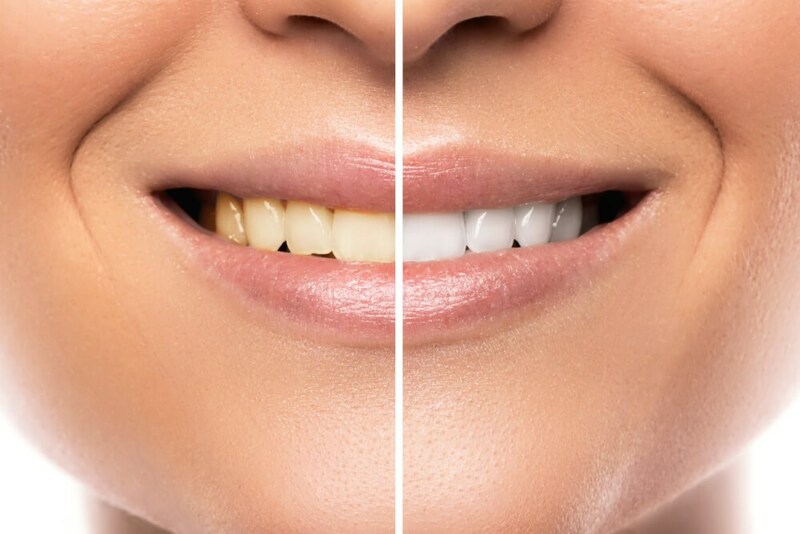 The demand for laser teeth whitening services is precisely because it is the lowest cost way to improve your smile and make you look years younger. For more information on pricing and availability, contact our office to book your free smile consultation today. You can also browse our laser whitening gallery to see real before and after photos from actual clients. Looking for something more? Ask us about our full Smile Makeover procedures. A full smile makeover is perfect for those who have let a dental insecurity rob them years of smiling confidentially. Best of all, services such as Invisalign have revolutionized the dental makeover process. Want straight teeth without embarrassing braces? Invisalign helps enable our patients to keep their grown-up smiles. Our office offers FREE Smile Consultations. This can help you make an informed decision about any of the services our office offers. From laser teeth whitening to dental implants, our dentistry professionals are ready to make your smile something you're proud of. Browse our website to learn about more services we offer or book your free consultation using our online scheduler.